Iliotibial band stretches are a great way to reduce knee, hip and back pain and the symptoms of iliotibial band syndrome. Here, we share our 5 favourite ITB band stretches, with easy to follow instructions and images to help you beat ITB pain. The Iliotibial Band (ITB) is a thick band of fibrous tissue that runs down the outside of your leg from your pelvis to your knee. Some of the buttock and hip muscles attach to it and the ITB co-ordinates how these muscles work and stabilises the knee. Tightness of the ITB can make subtle changes to the way the knee moves resulting in knee pain, particularly in runners. It can lead to patella maltracking, where the kneecap doesn’t glide properly as the knee moves which can lead to a whole range of knee and kneecap problems. 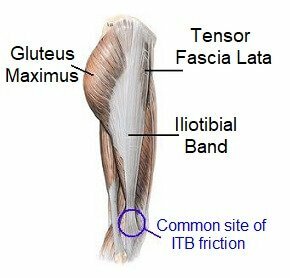 Tightness in the ITB can also irritate the hip and knee bursa, small fluid filled sacs that provide cushioning between the Iliotibial Band and the bones underneath, causing inflammation and pain. 1) Iliotibial Band Syndrome - Common in long distance runners. Causes pain on the outer side of the knee and thigh. ITB tightness can also contribute to a number of different knee problems so iliotibial band stretches is often an important part of rehab, particularly for runners. Stretching the ITB is slightly different from stretching other muscles, as the ITB is a thick, fibrous band rather than an elastic muscle. Here we will show you how to build up your Iliotibial Band stretches to help relieve hip and knee pain. If you haven't already, visit the knee stretches intro page for information on how to get the best results from iliotibial band stretches. You will find five different Iliotibial band stretches to choose from here. With each one, the description/pictures show you how to stretch your right ITB. To stretch the left side, just reverse the instructions. You only need to do one or two of these stretches – choose the iliotibial band stretches that work best for you. To be most effective you need hold each of these stretches for 30 seconds and repeat them 3 times. Starting Position: Stand upright and cross your right leg behind your left. Starting Position: Start as with the first exercise but cross your right leg further over behind you to the left. Place your hands on your head or lean on a wall for support ensuring your hands are above your head as this increases the stretch. Action: Lean to the left whilst gently gliding your hips to the right until you feel the it band stretching. Hold for 30 secs. Progression: You can increase the intensity of iliobtibial band stretches by using a foam roller. Lie as shown with the roller underneath the area of pain (at a right angle to your body) and as you hold this stretch, gently roll backwards and forwards on the roller. If you find it hard to do Iliotibial band stretches effectively, getting someone to help can make a big difference. They may be able to help you stretch your ITB further than you can on your own. Starting Position: Lie on your back with your legs straight. ITB tightness is often accompanied by buttock tightness and weakness. Visit the glute stretches and knee strengthening exercises sections for more exercises that may help. For top tips on getting the best out of iliotibial band stretches, including quick tests to tell if your muscles are tight and how to get the best results for the least effort, visit the knee stretches overview. Often, there will be tightness in more than one muscle – find the best stretches for tight quads, hamstring, calves and glutes muscles to make sure you are getting maximum benefit from these iliotibial band stretches for your knee.